If I said “The health of your indoor plants entirely depends on the quality of light you provide,” would you agree? Of course, and that’s the reason I’ve decided to provide a detailed Bloomspect 600W LED Grow Light Review. I believe each product has some dark sides as well and it is essential to discuss them. Sometimes by neglecting dark sides of an LED one may spoil his whole efforts and hard work. So in this review we’ll first explore all the features provided by Bloomspect 600w Panel, and then I’ll review its specification details and in the box elements. Don’t worry! We’ll provide you with its advantages and disadvantages in brief as well. From look and feel point of view, I must say it’s an elegant piece of hardware. However beauty of design doesn’t matter because its contribution to the importance of an LED grow light is about zero. The build and LED quality make up the durability and performance. 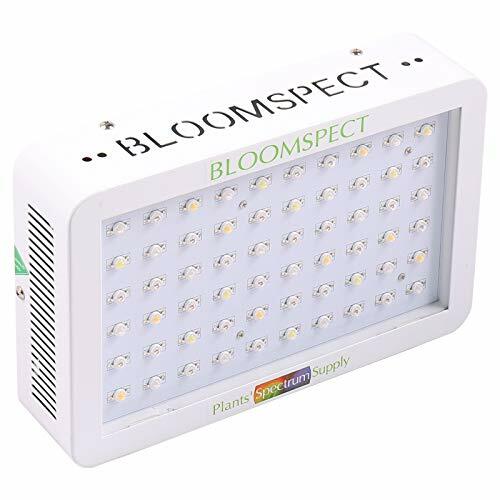 With that said, the Bloomspect 600W BS600 is built using reliable and decent materials. Yeah, its build could allow the BS600 to stay inside your grow space for around 100,000 hours. Moreover, it features a 15.8” X 11.2” X 2.8” of dimensions with a weight of 10.6 lbs. It’s quite light weight for a well built product. The Bloomspect BS600 LED grow light features two separate mode switches for comfort. However, these switches are not dimmable. The switches allow you to turn ON/OFF the red (bloom) and blue (veg) lights using it. Also, a daisy chaining port is there to help you when you decide to enlarge your grow area and bring new light. Our plants crave for real light, and it’s the only responsible factor for their perfect growth and survival. However, it’s also one of the most significant challenges while growing indoors. Yeah, it is not possible to bring sun to our house, and that’s why we try to replace sunlight using artificial LED grow lights. But it’s more of an art than a science. Place your lights too close or too far and your cannabis yield could be affected. A light that doesn’t cool well might annoy your plants. In summary a good light is an must possess all the bands that are available in the real sunlight, as well as having good placement and cooling. Moreover, in our case, Bloomspect has done a fabulous job in this sense. 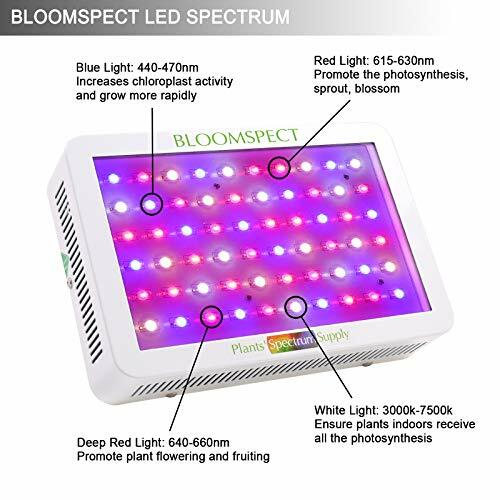 The Bloomspect BS600 LED Grow Lights delivers a complete full spectrum of 12 bands. Yeah, with the help of 120 LEDs of 5W and different color in each it becomes possible to mimic the real sunlight at its best. The ratio of Blue:Red is well balanced and settled according to various conditions and phases our plants go through during its lifecycle. Moreover, if you’re concerned about shade, then it spreads pink shade inside the grow space. So yeah, better flowers and resin for heavy yields is yet another advantage from its brightness. You might have noticed many brands mentioning coverage capability that is hard to believe. It’s not illumination that matters, but it’s the intensity of light that needs to be a concern. 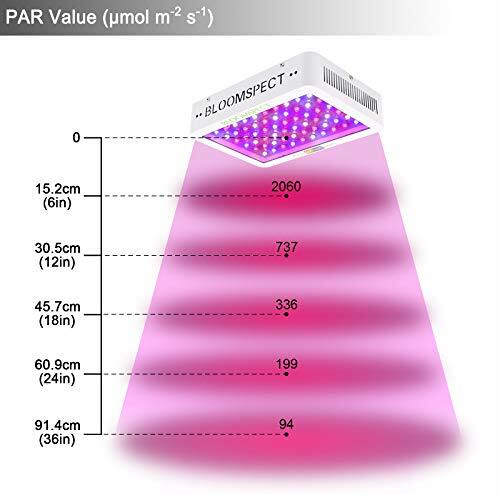 If you hang a grow light at 5 ft high then even it can illuminate more than 10’X10’ of space. However, in that case, the quality of light will be compromised, and that will not be beneficial for your plants. To determine the quality of light there is a standard or measure that gives you a brief idea about beneficial footprint from grow panel. Yeah, it’s PAR or PPFD, and that tells for how much area a light could spread beneficial and elemental light. Well in the case of Bloomspect’s BS600 600W model, it provides 811 uMol from 22” height and 1240 uMol from the height of 18”. It’s been verified in our research. Moreover, I must admit it here in this Bloomspect 600W LED Review, that with these results it becomes capable of competing for even some of the top-notch brands. Also, this level of intensity with provides more penetration over your plants and better absorption rates that will bring happiness concerning yield. You might have noticed we never mention HPS replacement as a feature because we believe that HPS is complete crap and used to trap the consumers by showing more prominent figures. The truth is HPS grow lights will cost you more to run while being less efficient. The best LED grow lights outmatch their HPS competitors efficiency by leaps and bounds. As I mentioned in my previous point, real coverage determination is only possible when you have precise figures and results of a PAR Test. Luckily, most light manufacturers run these tests during the design phase and provide you with accurate measurements in the product description. During Vegetation the Bloomspect BS600 will cover a massive area of 4’ X 4’. On the other hand, in the blooming phase it needs to be closer to the plants, and hence it decreases to 3’ X 3’ of space. The coverage determination is from two different heights which is 24” during vegetation and 18” during bloom. Also, for better results, we recommend turning both (Veg & Bloom) switches to ON. Moreover, if you’re already impressed by this grow light’s PAR results but having difficulties in choosing it due to large coverage plans, then you have two options. Yeah, one is to utilize the daisy chain port and order 2 lights, which will cover around 8’ X 8’ of grow space at max. Moreover, the Second option is to choose a bigger variant from the same manufacturer. Most manufacturers make 3-6 model variants beginning at 250w-300w, and going up to 2000w grow lights. I conducted a survey seeking a mistake that people made while deciding to buy an LED grow light. Well, my motive was to identify the majority of mistakes made by people and to stop others from repeating the same. Almost everyone that’ve bought an LED made a same mistake of neglecting power consumption factor. Also, many are regretting the mistake or at least keeping it in mind for the next time they buy LED grow lights. Consider total power consumption as the major consideration factor. Mix and match your lights to your exact needs. Don’t even consider grow lights that aren’t LED. You can view all the Best LED grow light options on our home page. As far as Bloomspect BS600 600W LED Grow Light is concerned, it will require 268W of electricity for best results and perfect performance. That’s what makes it one of the Top-Notch 600W LED Grow Light. It’s optimal compared to the majority of grow lights available in this price segment. Still, if you have any other option which is better or equal to the Bloomspect 600w regarding performance, surely go for it. Having learned the important factors from this review you’ll be well armed to make a great choice. Well balanced temperature and stable atmosphere in an indoor growing space play major role in better plant growth. Not directly, but indirectly. The more stable and balanced the temperature, the better the outcomes. Also, there are several practices to optimize your grow environment, like using an inline fan or humidifier in grow tent. However, while designing an LED, almost all brands keep this factor in their mind and utilize an aluminum heat sink and some cooling fans on the panel. So, that even after several hours of working light stay cool and fresh. Well, Bloomspect as well comes with 2 massively powerful cooling fans and an aluminum heat sink which is designed by highly qualified engineers. Yeah, even after 24 hours of working it will stay normal and will not disturb the things inside grow space. Also, it has been reported by our readers who’re using it inside their grow space. Although we don’t recommend using a grow light for 24 hours straight. Bloomspect offers one-year complete warranty to their customers. It’s a shorter warranty time compared to other brands, but if you won’t need to use it, what will it matter? However, a thing which grabbed our attention and justified this period is its low damage rates. However, almost 9 out of 10 reviewers rated the product highly, and you can see for yourself here) I highly doubt that’s indicative of a product that has frequent maintenance issues. For the price of the Bloomspect 600w grow light you simply can’t go wrong. Above all, the brand also provides 30 days money back policy so in case you feel any issue you’re free to raise a refund claim and they’ll provide money back without any question. 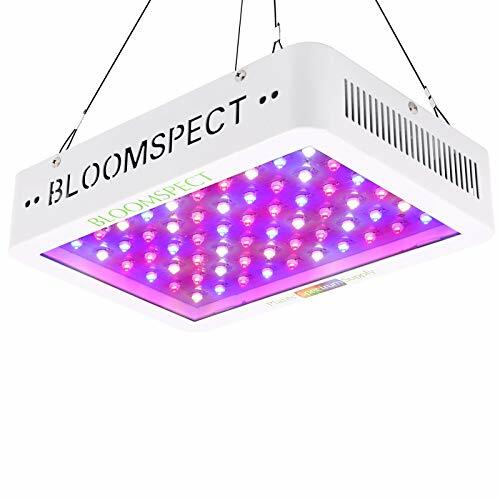 So, folks, that’s all I wanted to convey to you with the help of this Bloomspect BS600 LED Grow Light review. Also, here’s a quick representation of benefits and drawbacks of using BS600 LED from Bloomspect. Have a look for better decision making. The inclusion of IR in its color range. Daisy chain for future expansion. High qualified research & Development team in its making. Tested by real life indoor growers. Well balanced temperature and inside atmosphere. Warranty period is less compared to others. Dimmers would offer extensive control over brightness as well. Now, as you’re familiar with its dark and bright sides, we’d like to showcase some of the opinions obtained by real-life growers who’re using it for various purposes inside their grow space. Question :- Since When you’re using BS600? What would you say about its spectrum? I’ve been using it for the last 14 months. I’m not a technical person and don’t know much about spectrum and bands. However, all I can say is effect of light created by my bloomspect 600W LED Grow light is more dense and intense compared to my old LED grow light. Also, I’ve noticed better outcomes since I’m using it. Regarding plant heath as well as flower quality. Being frank, in my opinion it is one of the best led grow lights under $200. Question :- Are you happy and satisfied with Bloomspect BS600? What’s the main reason if yes? The reason for my satisfaction is the reason I migrated to LEDs. Its more stable and cool compared to my old HPS lights. Also, It provides a fabulous footprint for my plants in a 4’X4’ area. Question :- What are the factors that disappointed you after using it? Warranty! Before making my final call I saw another option with same capabilities and better warranty terms. So I was a bit confused in its selection. However, due to price I decided to give it a go and to use it over the last 16 months. No issues have been encountered as of now. Well, that’s just a glimpse over some of the answers obtained by users in our survey, if you’ve still any question or confusion, then you’re free to drop it in our comments section, and we’ll try to help you with it. Now, let’s take a look at the things that you’ll be getting inside the box. As you can see, in this Bloomspect 600W LED Grow Light Review, our prime concerns were those factors which plays an elemental role in our plant’s growth and sustainability. Also, we aim to hunt for those products only which don’t compromise on any factor that could spoil one’s hard work. 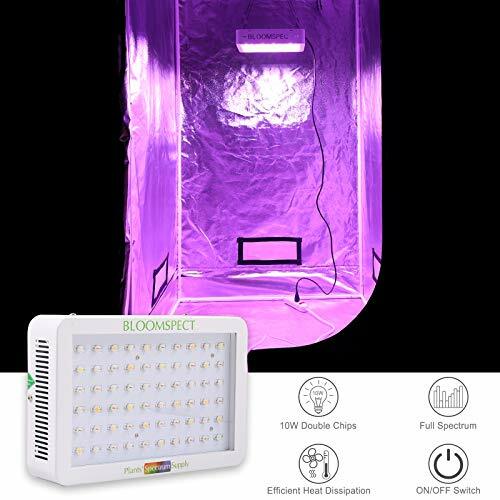 So yeah, we’ll recommend bloomspect BS600 LED to all those who want to enlighten their grow space with a full spectrum and high-quality intense light. 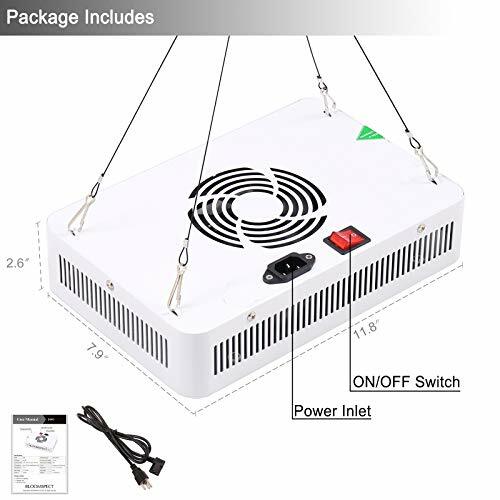 However, nondimmable mode switches are provided in this LED, but if you’re free with your budget then you can add some more bucks and check out Viparspectra Dimmable Series PAR700 LED Grow Light as well.